As more NATO trucks were being torched in Peshawar last week, a Karachi student managed to fling his shoe at warmongering US journalist Clifford May during his address to the Department of International Relations on “Pakistan ’s Role in Countering the Challenge of Terrorism”. In Washington, Pakistan’s Foreign Minister Shah Mehmood Qureshi announced bitterly the US probably knows Osama Bin Laden’s where-abouts. 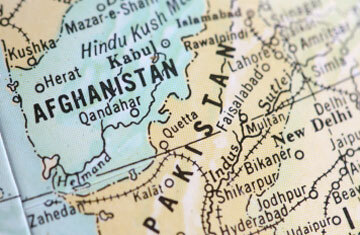 He neglected to draw the appropriate conclusion about what the US is really up to in AfPak. Also in Washington, within hours of the decision of the Nobel Peace committee, US President Barack Obama met with his War Council. It’s getting to the point that it’s hard to tell who is the biggest opponent of Obama’s plans to bring peace to AfPak: the Taliban, the Pakistani government, or the Nobel committee. Oh yes, or virtually the entire world beyond the Washington beltway. As the world marked the eighth anniversary of the US invasion of Afghanistan on 7 October, the Taliban were stronger than ever – their forces have increased nearly fourfold since 2006. “We fought against the British invaders for 80 years,” Mullah Mohammad Omar reminded the world on the Taliban’s website www.shahamat.org. “If you want to colonise the country of proud and pious Afghans under the baseless pretext of a war on terror, then you should know that our patience will only increase and that we are ready for a long war.” A statement from the leadership insists, “We had and have no plan of harming countries of the world, including those in Europe. Our goal is the independence of the country and the building of an Islamic state.” They call for the immediate withdrawal of foreign troops as the only solution. So far, there is no hint that Obama is even considering this no-brainer. On the contrary, the war is now being fought on two fronts, with the US and Britain starting an extensive training programme for Pakistan ’s Frontier Corps (FC) in Baluchistan, the new battleground. It is part of the Obama administration’s massive military aid package to AfPak – Pakistan will get $2.8 billion over the next five years in addition to $7.5 billion in civilian aid, but only if it satisfies US benchmarks by making progress in “anti-terrorism and border control”. The Pakistani government and army are furious, not to mention the 60 per cent of Pakistanis who see the US as the greatest threat to Pakistan – with good cause. In the past few months, US forces have stepped up their aerial bombardments of villages in the northern tribal areas. According to the Pakistani press, of the 60 cross-border US drone strikes between January 2006 and April 2009, only 10 were able to hit their targets, killing 14 Al-Qaeda leaders and 687 civilians. Even official US policy (to kill no more than 29 civilians for every “high-value” person) is being violated. At least 23 Al-Qaeda leaders should have been killed, nine more than the actual 14. This assassination campaign is a more ruthless version of Operation Phoenix in Vietnam, and can only spur the Taliban and Al-Qaeda’s recruitment efforts. True, Taliban control of the Pakistan frontier province SWAT was brought to a brutal end during the past six months by the Pakistani army, though civilian corpses continue to be dumped, with accusations of revenge and official terror labelled at the army. And the almost complete lack of reconstruction aid by the Pakistan government – with winter approaching – means the Taliban will probably regain SWAT. Local opposition to the war against both Afghanistan and Pakistan’s frontier region, especially Baluchistan, continues to grow, with the long-simmering Baluchi campaign for independence gaining new life daily. Obama’s war plans have reached a critical stage. In an arrogant gamble, much like General MacArthur’s challenge to president Harry Truman in 1951 over the Korean war, General Stanley McChrystal recently demanded publically that Obama provide 60,000 more troops for Afghanistan, boldly stating the war would be lost without them. Faced with a similarly outspoken MacArthur, Truman just as publically fired him. McChrystal is said to have offered the Commander in Chief several alternatives “including a maximum injection of 60,000 extra troops”, 40,000 and a small increase. Common in military planning is to discuss three different scenarios in order to illustrate why the middle option is preferable, though this is usually done privately. But the Obama administration faces growing hurdles within his Democratic Party if he decides to go with even the middle option. Obama’s review of AfPak is now centring on preventing Al-Qaeda’s return to Afghanistan – a narrower objective that could require fewer, if any, new American troops. Obama-Biden no longer see the primary mission in Afghanistan as completely defeating the Taliban or preventing its involvement in the country’s future, a policy strongly opposed by Defence Secretary Robert Gates and Secretary of State Hillary Clinton. Gates-Clinton have a point: once the Taliban are acknowledged as legitimate players who are of no strategic danger to the US, then the horror of the past eight years becomes excruciatingly clear. The defeat of the whole criminal project becomes inevitable and will be just as devastating for the US as the Soviet defeat was for the USSR. But the Gates-McChrystal super-surge is just about impossible in any case. The Institute for the Study of War reported recently that the US military has only limited troops ready for deployment, meaning that forces might not reach the warzone until the summer of 2010. There are only three Army and Marine brigades – 11,000-15,000 troops – capable of deploying to Afghanistan this year. Troops are plagued by a severe lack of helicopters and all-terrain vehicles. Whatever Obama decides – 60,000, 40,000 or 2 – the troops will have little time after they arrive to turn things around. Even super-loyal Canadian Prime Minister Stephen Harper just reaffirmed that Canadian troops will under no circumstances stay in Afghanistan after 2011. Any plans for the indefinite occupation of Afghanistan as touted by some NATO and US officials are fantasy; Canada ’s retreat will be part of a flood. Canadian government support for the war, like that of its bigger brothers the US and Britain , has all along been motivated by Afghanistan ’s untapped resource potential. The TAPI gas pipeline – so named for its 1680 kilometre path from Turkmenistan through Afghanistan, Pakistan, and eventually India – is slated to be constructed starting next year on the very soil that Canadian and US troops now occupy in southern Afghanistan. Harper’s best-case scenario is for the pipeline to go ahead with Canadian participation and for a miracle to occur – the Taliban’s sudden and unexpected defeat, allowing Canadian troops to come home, the pipeline and other resource deals signed, and assuring him of a Conservative majority in the next election.“ Canada has the potential to beat rivals because it has such an uncheckered history in that part of the world,” argues Rob Sobhani, president of Caspian Energy Consulting. “People like Canadians, Canadians are apolitical.” Even if the miracle doesn’t happen and the pipeline deal collapses, Harper realises his political goose is cooked unless the troops come home, so he is forced to wash his bloody hands of this betrayal of Canad ’s traditional international role of peacekeeper. Obama needn’t rely on the Taliban as advisers on how to end the war. Deputy-general of the China Council for National Security Policy Studies Li Qinggong reflected official Chinese thinking on 28 September in Xinhua: The United States should first put an end to “the anti-terror war” and “end its military action. The war has neither brought the Islamic nation peace and security as the Bush administration originally promised, nor brought any tangible benefits to the US itself. On the contrary, the legitimacy of the US military action has been under increasing doubt.” Obama should take advantage of international opinion to withdraw troops immediately. This is no doubt also the hope of the Nobel committee that put its own credibility on the line by awarding him the Peace Prize. The UN Security Council permanent members should “draft a roadmap and timetable”, including deployment of an international peacekeeping mission. The delicious irony of the US invasion and occupation of Afghanistan (and Iraq ) is that it is China, the US ’s real international rival, that has benefited most. Chinese investments (and workers) have been pouring in to both US warzones. The main effect of George W Bush’s two wars and Obama’s AfPak has been to promote Chinese business interests, leaving the US bankrupt and its army in tatters.